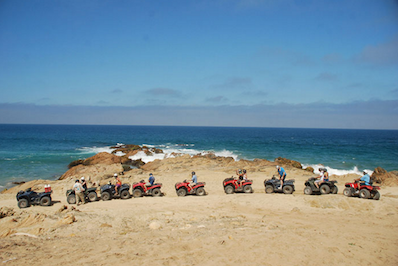 It isn’t unusual for vacationers to bring their ATVs to Mexico for a time of fun and exploration along beaches or in desert areas. However, you might wonder about the availability of a Mexico insurance policy and how to protect your ATV investment when driving in Mexico. Check Mexico insurance comparison quotes for your best options through MexicanInsuranceStore.com, a top rated provider of best available Mexico insurance protection. Your primary Mexican insurance for cars coverage should be re-evaluated to account for any towing activity involving your ATVs. Additionally, there are some limited cases in which your ATVs might be insurable for theft coverage while not attached to the trailer or vehicle. Check out Mexico insurance at the MexicanInsuranceStore.com website. Although some take their ATVs in the bed of a truck, many will tow them. In such a case, towing details must be added to your Mexican insurance for cars policy to ensure that you are legal for driving and towing. Without listing all the items you are hauling, your coverage will be compromised in case of an accident and your claim will probably be denied. Further, a towing accident without towing coverage can invalidate your entire Mexico insurance policy, which would leave you owing all costs assessed to you based on the incident. If your Mexican insurance for cars has been selected in advance of your decision to take the ATVs, you can make changes prior to your travel date. Money Saving Tip: Mexico insurance provided by the STORE covers multiple drivers, so split the cost of Mexican insurance for cars with friends and save money! Can Mexico Insurance Protect Your ATVs Against Damage? While reckless ATV driving is not recommended, accidents involving these small vehicles can be a bit commonplace. You might want coverage that will address not only your own damages but also those that could impact others if you have an ATV accident on a conventional road. In most cases, providers don’t offer ATV coverage period and its never covered off road. However, you can review the terms for ATV coverage with HDI Seguros, a provider that offers full coverage Mexico insurance solely for ATVs being driven on conventional roads. Again, this is of little use on the sand dunes, beach, or desert. However, it does benefit those using their ATVs to move about in a small community and if a separate full coverage policy is written, it does include theft. Safe driving is your most important factor in avoiding wrecks, especially in this generation of heavy smartphone dependence. Distracted driving can affect you because another driver errs, in which case, the quality of your Mexican insurance for cars could make the difference between being able to repair your vehicle in the US, Mexico or Canada (available at the STORE) or suffering devastating financial consequences. Mexico insurance from MexicanInsuranceStore.com includes Roadside Assistance at no extra cost, so you can enjoy your trip without worry no matter whwere you drive in Mexico. In Mexico, grocery shopping areas are a bit different. Stores do not want to stock similar items consecutively. So you can be sure, you’re getting new items from time to time while doing some shopping. Mexican Insurance Store is proudly serving a lot of Mexico travelers. Everything is in one place. This site offers more than an easy manner of getting insured with Mexican insurance. Your future travel plans in Mexico has an impact in your long-term options when securing Mexican insurance online for a foreign-plated vehicle. You can quickly enter the border. All you have to do is show your proof of Mexican insurance. Such insurance serves as your legal gate pass.